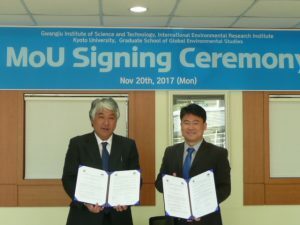 The memorandum of understanding for academic cooperation and exchange activities was signed between the International Environmental Research Institute (IERI), the Gwangju Institute of Science and Technology (GIST) and GSGES. The MOU was signed by Prof. Shinya Funakawa, dean of GSGES and Prof. Joon Ha Kim, director of the IERI of the GIST, accompanied by Assoc. Prof. and the head of international affairs Akihisa Mori, and Dr. Kenneth Widmer, the principal researcher and Oliver Kim, a researcher in charge of international affairs. In prior to the signing, expectation of further cooperation between two schools was discussed in a friendly atmosphere.